Alan Smith, Werrington Neighbourhood Council’s Planning Representative, attended the Pre-Inquiry Meeting held in September. Following this, the proof of evidence document was submitted, containing 46 pages and 5 maps, drawing upon all the data collected by the Railway Action Group. This has represented many hours of work by Alan (collating all the evidence and writing the document) supported by the work of the Action Group. Thanks must be expressed for the time and effort that this has taken. The Public Inquiry takes place from Tuesday 21 November at the Peterborough United Football Club when Alan will be present as a representor of the Neighbourhood Council and Werrington residents. The Neighbourhood Council are closely monitoring the removal of the trees and have determined that the trees will be replaced by a native species. 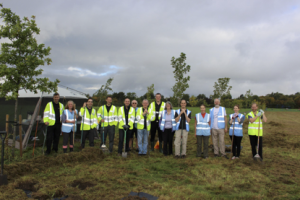 Further correspondence is being undertaken on this to ensure that the trees are in keeping with the local environment. WNC have received reports from the police about the local crimes statistics and updates from Councillors about travellers in the area, issues at the local skate park and lighting problems. Don’t forget our next drop-in event takes place at the Education Centre on Saturday 11th November between 10.30am and 1.30pm. Please come and let the Neighbourhood Council know what the issues are for your area. The autumn period has been a busy one for the group with two events, support to the consultation on the Werrington Brook improvements adjacent to Aubretia and Wysteria Way and some sad news to share. On 26th September the group with RiverCare held a wild flower meadow making day at the Hastings Road recreation ground supported by volunteers from the Environment Agency and local residents. The grass here has been left to grow long and provides an opportunity to create an area that is more attractive for both residents and wildlife. Despite heavy rain the night before, the volunteers set to raking up the risings to reduce the nutrient supply to the soil and planted patches of wildflower seed. The area will require further work to establish the meadow but a good start was made. The event was held alongside the consultation on the last stretch of the improvement works to the Werrington Brook due to start in November. On the 7th October we supported a RiverCare event aimed at establishing a baseline of photographs and water quality measurements before the November improvement works begin. The Environment Agency have also carried out a baseline biological survey of the brook which will give us a much better indicator of the improvements. Our band of trusty volunteers some regular, some new, managed to litter pick 35kg of rubbish from this stretch of the Brook, a great achievement at reducing pollution in our waterways, if only residents didn’t drop it in the first place. Sadly there was an oil spill in the Brook thought to come from an illegal disposal into a surface water drain and two swans were found covered in oil. The good news is that that the RSPB managed to rescue the swans but sadly one of them died whilst the other recovered well and has been returned to the brook. 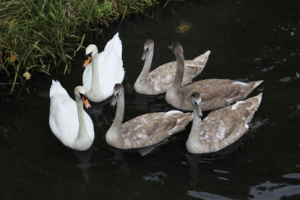 The loss of the swan underlines the fragile nature of our water environment and how vulnerable our local wildlife is to careless disposal of waste. Residents are encouraged to report any suspicious behavior to the police on 101 and if you observe any pollution in the Brook to report it immediately to the Environment Agency hotline on 0800 807060. If we act quickly such tragedies may be averted. Looking forward the group is hosting another drop-in at the Werrington Community Education Centre on the 11th November 1030 until 1330 with a free cuppa and cake, so come along and talk to us about your thoughts and ideas for improving the Werrington environment and help us develop our plans for 2018. Like our facebook page and keep up to date with plans and future events.